By mikey from austin ,tx. 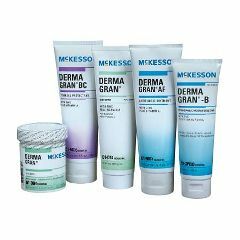 Soothing McKesson DermaGran GP is recommended for use as a moisture barrier on external skin areas where repeated exposure to body excrement and exudate may cause skin breakdown. May be used as a skin barrier on friction points. Uses of DermaGran GP: Helps prevent and temporarily protect chafed, chapped, cracked, or windburned skin and lips. For the temporary protection of minor cuts, scrapes, burns, and sunburns. Helps treat and prevent minor skin irritations due to diaper rash and helps seal out wetness. Latex-Free. DermaGran is a registered trademark of Derma Sciences, Inc. & used by permission of Derma Sciences, Inc.
Used for months in the hospital. I wanted it for home use. Dry Skin. Cracked skin. Daily Use.